We break down the different versions of Kingdom Hearts 3 available for pre-order, and which one you should buy. Gamers looking to pre-order a copy of Kingdom Hearts 3 will likely be wondering what the difference is between the Standard Edition and Deluxe Edition. The purchase price is the most obvious difference, though there are actually two variations of the Deluxe Edition to consider. With less than a week to go before the release of Kingdom Hearts 3, there’s little time left to pick out which version of the game you wish to buy. To help make things less confusing, we’ve put together a quick guide on the differences between pre-ordering the Standard Edition and Deluxe Edition of Kingdom Hearts 3! The differences between the Standard and Deluxe Editions of Kingdom Hearts 3. There are three different versions of Kingdom Hearts 3 available for pre-order, Standard Edition, Deluxe Edition, and a special Deluxe Edition exclusive to the Square Enix website. Each version comes in at a different price point and includes different pre-order bonuses. There are a variety of locations where you can pre-order the Standard Edition and Deluxe Edition, though there’s also a special Deluxe Edition that can only be pre-ordered on the Square Enix website. Depending on where you pre-order the Standard Edition of Kingdom Hearts 3, you can receive bonuses like the Dusk Till Dawn Keyblade DLC when pre-ordering on Amazon. The Standard Edition of Kingdom Hearts 3 is the cheapest version available for pre-order at $59.99. You can pre-order the Standard Edition at a variety of different locations including GameStop, Best Buy, Amazon, Walmart, and Target. Unlike the Deluxe Edition, the Standard Edition offers few pre-order bonuses. The main benefit of pre-ordering the Standard Edition is ensuring you get a copy once the game releases. Additionally, digital pre-orders like those available on the PlayStation Store allow you to automatically download the game, meaning you can jump in faster when the game is released. Depending on the retailer, some may offer small bonuses with the Standard Edition, like Amazon which offers the Dawn Till Dusk Keyblade DLC with their pre-orders. On the Square Enix website, they’re offering a free Kingdom Hearts 3 sticker set with any physical pre-order purchase, including the Standard Edition. The Deluxe Edition of Kingdom Hearts 3 includes an artbook, collectible pin, and steelbook case. The Deluxe Edition of Kingdom Hearts 3 is available for pre-order at $79.99. You can pre-order the Deluxe Edition at a variety of different locations including GameStop, Best Buy, Amazon, Walmart, and Target. Unlike the Standard Edition, the Deluxe Edition comes with several pre-order bonuses. 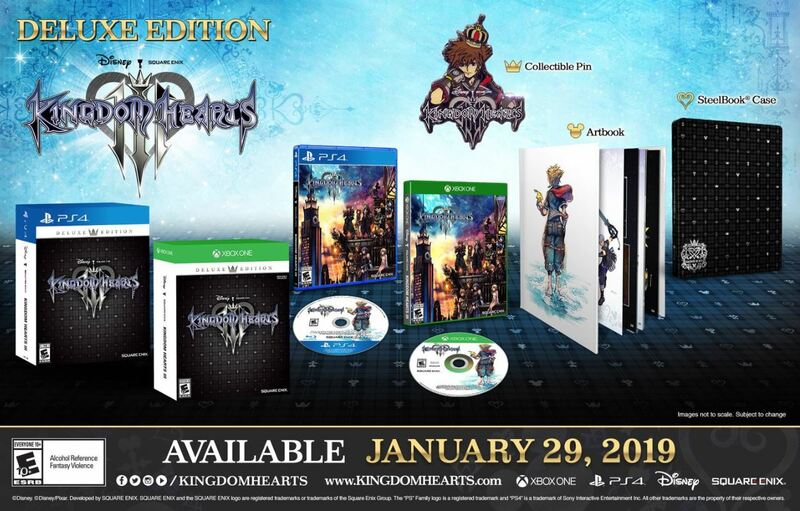 Included with the Deluxe Edition of Kingdom Hearts 3 is an artbook, collectible pin, and steelbook case. Additionally, like pre-orders for the Standard Edition, certain retailers will offer unique pre-order bonuses in order to entice you to pre-order with them. For example, GameStop is offering an Exclusive Fabric Poster with pre-orders of the Deluxe Edition of Kingdom Hearts 3. The special Deluxe Edition of Kingdom Hearts 3 can only be pre-ordered on the Square Enix website. Last, but certainly not least, there’s a special Deluxe Edition version of Kingdom Hearts 3 exclusively available for purchase via Square Enix. You can pre-order the special Deluxe Edition of Kingdom Hearts 3 for $229.99 and receive similar bonuses to the regular Deluxe Edition with a few extra goodies included. 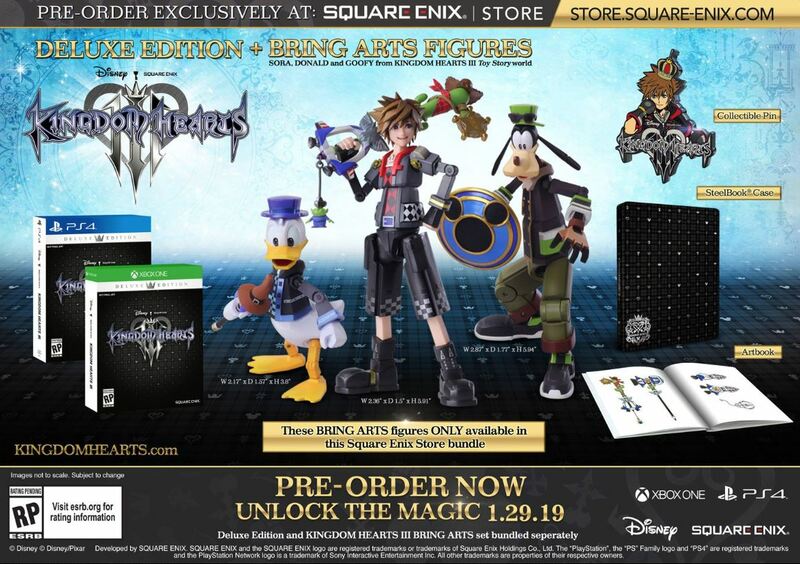 The special Deluxe Edition of Kingdom Hearts 3 includes an art book, collectible pin, and steelbook case, as well as three “Bring Arts” figures of Donald, Goofy, and Sora. Again, the special Deluxe Edition can only be pre-ordered on the Square Enix website, so if you’re looking for best version possible to pre-order, you’ll need to go through Square Enix directly. 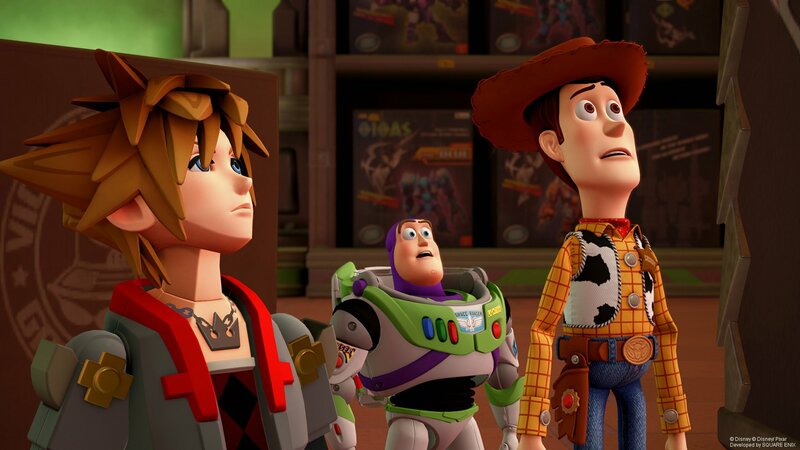 After reviewing the different versions of Kingdom Hearts 3 available, which one do you plan on pre-ordering? Will you pre-order the Standard Edition on Amazon to get the Dusk Till Dawn Keyblade DLC, or will you pre-order the special Deluxe Edition on the Square Enix site to get the three different “Bring Arts” figures? Let us know down in the comments below! 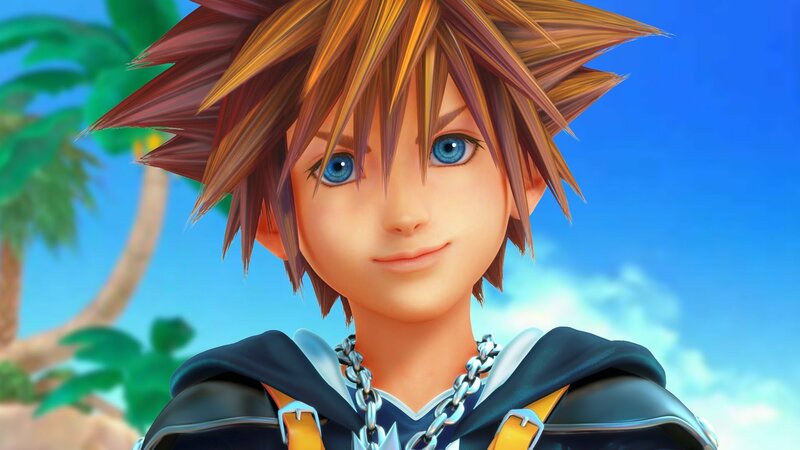 For more on Kingdom Hearts 3, be sure to check out some of our previous guides including when Kingdom Hearts 3 is scheduled to release, the news that the story epilogue for Kingdom Hearts 3 won’t be available at launch, and the news that Kingdom Hearts 3 includes LCD retro mini-games.